Jiangsu is situated between east longitude 114°18′ and 121°57′, north latitude 30°45′and 35°20′. 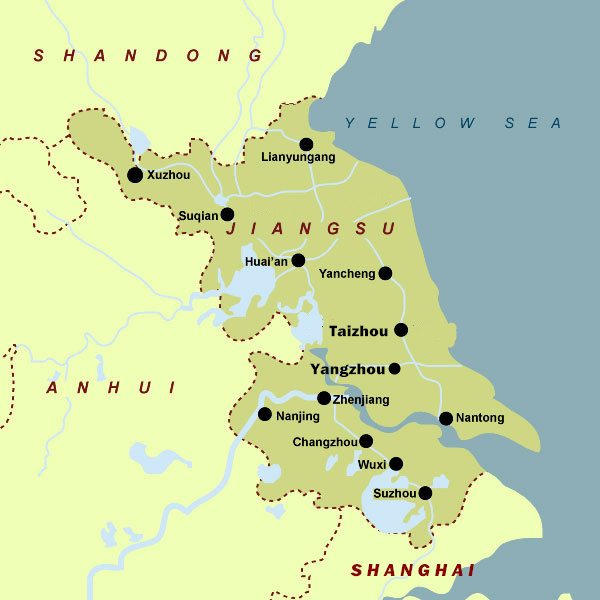 Jiangsu faces the Yellow Sea in the east, bordering Shandong Province in the north, Anhui Province in the west, and Shanghai and Zhejiang Province in the southeast. Owing to its advantageous geographic location and easy access to a vast hinterland, Jiangsu province is becoming one of the most developed provinces in China. Located in the beautiful and prosperous Yangtze Delta, Jiangsu thus enjoys the authenticity of its natural scenery while simultaneous maintaining a solid economic foundation, making it an idealistic destination for business, tourism or study. From the beginning of China's economic reform to the subsequent entry into the world economy 30 years ago, Jiangsu province has worked extensively to foster its economic roots within China and the global economy. Jiangsu's economic and social development has made remarkable achievements, and since 1992, the province's GDP has maintained a consistent two digit growth per year. It comes as no surprise that the numbers of international students enrolling in universities in Jiangsu has been on the rise since the inception of the study tour program. Jiangsu has always attempted to foster relationships with international students, but with the current development of the Chinese economy and the overall globalization of the world, many barriers have been removed, allowing those wishing to study outside of their home country to do so in China. These exchanges are seen as mutually beneficial as they give the student international experience while also create future economic ties between China and the student's home countries, planting the seed for economic development and allowing the student to be immersed in the Chinese language and culture. Jiangsu province covers an area of 102,600 sq kilometers, occupying 1.06% of the total land in China. The topography in Jiangsu is composed almost entirely of flatlands, taking up approximately 70,000 sq km. The remaining land is covered in either mountain ranges (10,000 sq km) or large bodies of water (20,000 sq km). Jiangsu’s main flatlands are divided throughout the province, the main ones being: Sunan (South Jiangsu), Jianghuai (the Yangtze River and Huai River), Huanghuai (the Yellow River and Huai River) and Eastern Seashore. Jiangsu province is also home to the Taihu Lake and Hongze Lake, which are among the top five freshwater lakes in China. In Jiangsu, there are now 134 colleges and universities with about 1.8 million students. The number of university students in Jiangsu encompasses approximately 10% of the total university students in all of China, and 2.7% of the entire world. Higher education institutions in Jiangsu have established exchanges and cooperative relationships with more than 500 overseas universities and colleges. Since admission of international students became legal in 1976, more than 130, 000 international students from 175 foreign countries have come to study in Jiangsu. More recently, the number of international students has increased by an average annual rate of nearly 15%. There are 15 Chinese Government Scholarship Programs available at the many universities in Jiangsu, making this province one of the major benefactors for foreign students in China. Unsurprisingly, Jiangsu has been a tourist destination for thousands of years. Nanjing, Suzhou, Yangzhou, Zhenjiang, Changshu, Xuzhou and Huai’an are famous historical and cultural cities that embody the rich history of China. Sixteen cities in the province have been noted as exemplary tourist destinations, including the cities of Nanjing, which has been the capital of six different dynasties, and Suzhou, a relic of ancient China. There are 3 major tourist centers in Jiangsu, namely the Yangtze River, Tai Lake and the Xuhuai twin cities (Xuzhou and Huai’an). There are now 20 well-known scenic spots, 23 parks, six tourism and holiday resorts and 461 historical sites under state and provincial protection. Nine classical gardens in Suzhou are designated by UNESCO as world cultural heritage sites and in 2010, income from domestic tourists visiting Jiangsu amounted to 468.5 billion yuan. Situated in a transition belt from a subtropical to temperate, the province has a monsoon climate typical of South-East Asia. Generally, it is mild with moderate rainfall with a clear distinction between the four seasons. Annual average temperatures are between 13-14 °C and the average annual rainfall is approximately 1,002.7 mm.